One more makes four....hmmm, let's make that FIVE!!! : CRAZY WOMAN! Good news from our agency...they are trying to find out the status of our TA and I'm hoping for news tomorrow....pray friends, pray! I have defiently gotten on the train to crazyville! Distraction is the key! I stayed home yesterday and found myself pacing and anxious and checking the computer for news every 15m and jumping out my skin every time the phone rang hoping it was the agency...today..haircuts, lunch with the kids at Burger King and a play date with the Halls at the Children's Museum and my mind is defiently calmer...plus God sent me a HUGE piece of humble pie..
A dear friend of our who is only 41 and otherwise healthy had a heart attack last night..He and Mike have been friends since they were five and he was best man in our wedding...He is doing very well, and is expected to continue to do so. But to say the least I'm praying for bigger and more important things today and I'm feeling very humbled and very grateful everyone I love the most is healthy....If you would, please remember him in your prayers too. Fingers crossed for good news tomorrow! 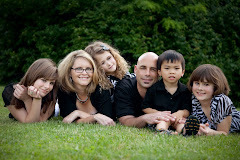 my favorite China adoption chat group has been a positive place..all the families with our paperwork date except us! has received notification that their TA is on the way Monday...it think that's good...let's just hope this leaves enough appt's for January for us all!!!! Will pray for you for good news tomorrow and also for your friend's complete recovery! I am praying that everything comes together today! !